Open this book and begin an epic human journey--the journey toward truth. Enjoy a delightful and imaginative allegory of timeless wisdom as you travel along the road of true knowledge. Socrates, the thoroughly reasonable and wise philosopher of Athens, will accompany you much of the way. With sharp questions and canny wit he will coach you past the winsome, the wily and the half-wise spin-doctors of error posted along the ancient byways. Every tempting path will be exposed as a road best not taken. Does God exist, and if so, what is he like? These and other essential questions provide guidance that delightfully entertains while directing your mind and spirit on the journey toward the freedom of truth. 2. The Skeptic: Is It True That There Is No Truth? 3. The Cynic: Can't We Be Cynical About Cynicism? 4. The Nihilist: Is the Meaning of Life That Life Is Meaningless? 5. The Materialist: What's the Matter with "Nothing But Matter"? 6. The Relativist: Is It Really Wrong to Think There's a Real Right & Wrong? 7. The Atheist: Can There Be a Moral Law Without a Moral Lawgiver? 8. The Pantheist & the Deist: Is God Everywhere or Nowhere? 9. The Jew: Could His-Story Be a Non-Prophet Organization? - Publisher Imagine a Pilgrim's Progress with Socrates as your guide through a landscape of philosophical roads and you've got a good picture of this spiritual allegory for modern pilgrims. Creative and humorous, it leads inquiring minds to tempting paths represented by famous philosophers and thinkers, then exposes why they are roads best not taken. Super for seekers. 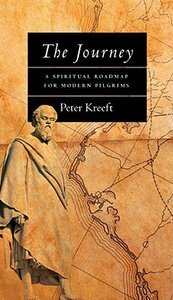 About "Journey: Spiritual Roadmap For Modern Pilgrims"
Imagine a Pilgrim's Progress with Socrates as your guide through a landscape of philosophical roads and you've got a good picture of this spiritual allegory for modern pilgrims. Creative and humorous, it leads inquiring minds to tempting paths represented by famous philosophers and thinkers, then exposes why they are roads best not taken. Super for seekers. Peter J. Kreeft (Ph.D., Fordham University) is professor of philosophy at Boston College where he has taught since 1965. A popular lecturer, he has also taught at many other colleges, seminaries and educational institutions in the eastern United States. Kreeft has written more than forty books, including The Best Things in Life; The Journey; How to Win the Culture Wars; Jesus meets Socrates; Jesus meets Sartre; Between Heaven and Hell and, with Ronald Tacelli, Handbook of Christian Apologetics and the soon to be released The Philosophy of Jesus and Between Jesus and Allah. 10. The Messiah: Is Jesus Lord, Liar Or Lunatic?